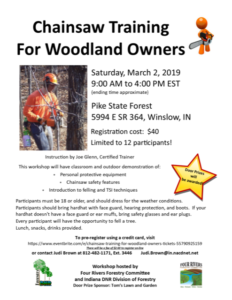 This workshop will have classroom and outdoor demonstration of: Personal protective equipment, chainsaw safety features, and an introduction to felling and TSI techniques. Participants must be 18 or older, and should dress for the weather conditions. Participants should bring hardhat with face guard, hearing protection, and boots. If your hardhat doesn’t have a face guard or ear muffs, bring safety glasses and ear plugs. Every participant will have the opportunity to fell a tree. Lunch, snacks and drinks provided.